Have you been searching for Ergobaby Baby Carrier for your child use at affordable price? This is opportunity to consider Ergobaby Sport Baby Carrier on this page. It’s not expensive yet it comes with the most features you will need in a carrier. Specs, pros and cons were also discussed; endeavor to take your time to read through proper understanding. The Sport Collection baby carrier provides comfort for both parents and child. 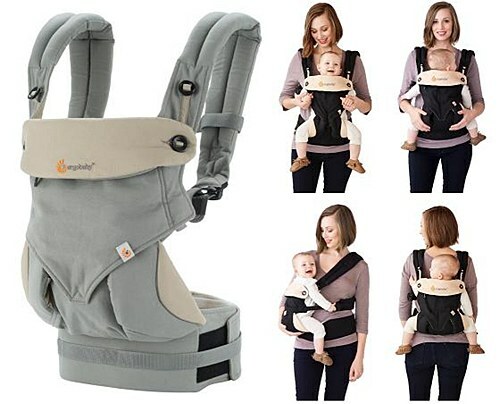 Its padded shoulder straps and waist belt helps to distribute baby’s weight between the shoulders and hips for long-term wear and also reduces pressure on your back. The waist belt and chest strap can be adjusted to suit your customized fit. The strong buckles and reinforcements at critical intersections ensure that the carrier remains firm and secure. The Ergobaby Sport Collection carrier offers three ways (front, hip and on the back) to carry your child. Front carry position is ideal for infants while the baby is cradled in the natural sitting position. This allows baby interaction with the parent’s and to turn away from overwhelming external stimuli. But when baby is up to 6 months or up to 45 pounds, then you can switch to the hip or back carry position. Ergobaby Sport carrier can be used from birth (7 pounds or more) up to 45 pounds. But one month’s old baby to be carried on the carrier, parents must use the Ergobaby Infant insert. Machine wash cold with mild detergent, dry on delicate cycle and remove when seams are still damp. Find out what amazons customers have said about the Ergobaby Sport Collection Baby Carrier …. The Ergobaby Sport Baby Carrier is one baby backpack your baby with love to stay in comfort. It design with padded shoulder straps, waist belt, Supportive hood and buckle for safety, baby weight evenly distributed across shoulder and hips. Baby one month must carry with infant insert.